Manufacturer of Security & Safety Systems, Personal Defenses, Police Security Systems & Products. 1. 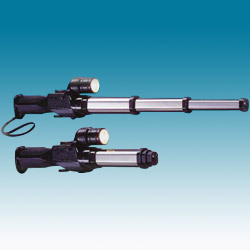 Model: SH-5M extendable stun gun. 3. Deliver a 120KV shock to a potential attacker,immobilizing him for several minutes. 4. And you can escape from danger.There is no danger of permanent. 5. 6pcs x aaa rechargeable battery. 6. Weight: 395g (with battery). 1. Powerful stun gun:Deliver a 120KV shock to a potential attacker,immobilizing him for several minutes. And you can escape from danger.There is no danger of permanent damage. 2. Alarm:130db High pitch tone. 4. With Saftey switch and holster.